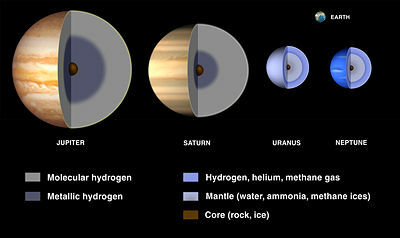 ^ See for example: Boss, Alan P. Formation of gas and ice giant planets. Earth and Planetary Science Letters. 2002, 202 (3–4): 513–523. Bibcode:2002E&PSL.202..513B. doi:10.1016/S0012-821X(02)00808-7. ^ Beebe, Reta. Jupiter the Giant Planet 2nd edition. Washington: Smithsonian Books. 1997. ISBN 1560986859. OCLC 224014042. 引文格式1维护：冗余文本 (link), pp. 38–41. ^ L. McFadden, P. Weissman, T. Johnson. Encyclopedia of the Solar System(2nd ed.). Academic Press. 2007. ISBN 978-0-12-088589-3. ^ Futurians. Fancyclopedia 3. [July 26, 2013]. ^ Guillot, T.; Stevenson, D. J.; Hubbard, W. B.; Saumon, D. Chapter 3: The Interior of Jupiter. (编) Bagenal, F.; Dowling, T. E.; McKinnon, W. B. Jupiter: The Planet, Satellites and Magnetosphere. Cambridge University Press. 2004. ISBN 0-521-81808-7. ^ Sudarsky, D., Burrows, A., Pinto, P. Albedo and Reflection Spectra of Extrasolar Giant Planets. The Astrophysical Journal. 2000, 538 (2): 885–903. Bibcode:2000ApJ...538..885S. arXiv:astro-ph/9910504. doi:10.1086/309160.